Image Credit: Nasa/Cassini - Click to go to the raw image. Thanks to Stuart for pointing this one out. Cassini has sent back another stunning image from Saturn. 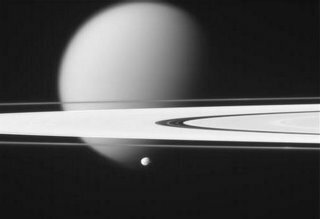 This one includes a section of the rings, with tiny moon Epimetheus (Diameter 115km) in the foreground and huge moon Titan (Diameter 5150km) behind the rings. The timing of these shots is impressive, given that Cassini is traveling at about 20km/h relative to Saturn, and Saturn is about 80 light minutes away from the Earth. This image is a 'raw' image from the Cassini website, meaning it is as sent back from Cassini without any additional processing. So we may see an 'enhanced' version over the next few weeks. Some interesting information on the Planetary Society Blog on the amount of data returned by Cassini to date. Cassini has just completed (yesterday) a flyby of Titan where the radar imaging equipment was used to survey the bright area on the surface know as Xanadu. You can observe Titan with a fairly modest telescope, see this Sky and Telescope article for details.